You can export all of your Chrome bookmarks into a single HTML file that you can use to import bookmarks back into Chrome if you get a new computer or you just want to keep a copy of all your bookmarks in a safe place – a safe place being any place other than your Windows drive (usually C:\). Behold! 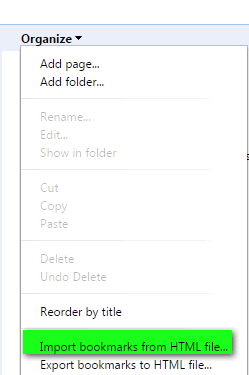 When you click on Bookmarks (above) you’ll see an option called Bookmark manager (below). Select it…that’s the way! Now gaze upon the screenshot below. You will note that Chrome will, by default, save the bookmarks document in your Documents folder, which is cool if your documents folder is on a different drive (other than C:\) like mine is. If not, we recommend you keep a copy on an external drive or a USB flash drive. If you get a new computer or your hard drive goes belly up, your bookmarks will be safe and sound on your USB or external drive. Just some good advice from your Uncle TC and your old Aunt EB. 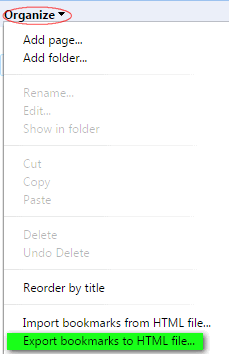 You will also note that Chrome assigns the file name for you which includes the date. You can, however change it to whatever you want it to be – like No-donuts-just-coffee or whatever makes your little heart go pitter patter (is that a solecism, EB? or just plain old bad spelling?). Well, you know what I meant. And that dear friends is how you export all your Chrome bookmarks to a HTML document. The document will have clickable links that you can open with any browser. And, if need be, you can import them back into Chrome by opening the Bookmarks Manager, clicking Organize and clicking Import bookmarks from HTML file (look below!). And that’s that! Go forth and save your Chrome bookmarks now or forever hold your pieces. We are approving your comments with conditions. We are not recommending nor have we vetted Symbaloo. Entrusting your personal data or even bookmarks to a 3rd party who stores them on a Web, especially those who tie all your information to your email address and or name and address should be checked out. So on the condition that our readers are aware we have not checked out, we do not use, and we are not recommending Symbaloo, we approve your comment. I do save my bookmarks to an external hard drive in this manner, but what happens if I decide to use a different browser. Did your remarks about Aunt Tilly’s Browser mean the bookmarks can be imported from this Chrome html file into another browser? I don’t understand how google bookmarks work. It is a complete mystery to me. You could easy automate bookmark export process with Backupery. I’ve been using it for about 3 months and it already helped me to restore several lost bookmarks. We are approving your comment with a caveat. We have not tested the program Backupery. We have no idea what their reputation is or whether or not they collect private data. Allowing a 3rd-party to manage your bookmarks, especially one that stores your information in the Cloud, needs to be vetted first. So we approve your comment with conditions.